Photo: David Bazemore Photo The play follows a writer, Jonathan (Jeremy Kahn, pictured center), on a pilgrimage through Ukraine to Trochenbrod, a shtetl that was converted into a ghetto during Nazi occupation. He is helped along the way by Ukranian guide Alex (Matt Wolpe) and Alex's grandfather (Adrian Sparks, right). As the generation that lived through World War II slowly ages out of existence, memories of the conflict that killed millions of soldiers, civilians, and war prisoners, including those lost to the Holocaust, are more frequently rendered as artistic representations rather than firsthand accounts. The war affected so many people all over the world that stories of the era offer points of view as varied as the people who survived to tell their story. One such example is Ensemble Theatre Company’s upcoming production of Everything Is Illuminated, a stage adaptation of Jonathan Safran Foer’s acclaimed novel of the same name, directed by Jonathan Fox. This play follows a young writer, Jonathan (Jeremy Kahn), on a pilgrimage through Ukraine to return to Trochenbrod, a long-ago shtetl that was converted into a ghetto during Nazi occupation. Jonathan’s grandfather was housed there and subsequently saved from annihilation by a woman lost to time. Their Ukrainian guide, Alex (Matt Wolpe), provides a dramatically different worldview (and comic foil) to Jonathan’s American college student and is accompanied on the road trip by his own grandfather (Adrian Sparks). “It’s very funny in some parts, and very dark and gripping in some parts,” said Fox, who describes Act I as a bizarre road trip through the Ukraine, and Act II as the reckoning with the ghosts of the past. Foer’s novel, which follows the stories of Jonathan and Alex as they experience this tour through history, also shows glimpses of the war era of the 1940s and the original Jewish community that existed on the land in the 1800s. “It’s an incredibly complex feat to adapt such a novel and make the story dramatic for the stage,” explained Fox. 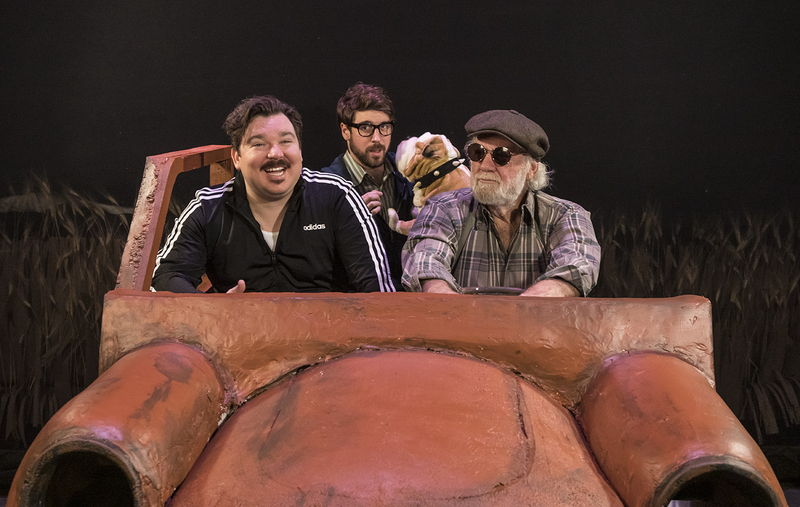 A fan of Foer’s work, Fox described this adaptation (by Simon Block) as capturing the novel’s “acerbic, ironic wit and tone.” Kahn described the show as a “sprawling journey across the Ukrainian countryside” complemented by the intimacy of the three men in the car. This is an important piece for Fox, who, as the artistic director of Ensemble Theatre Company and a fan of Foer’s work, is pleased to present the Southern California premiere of this show. Fox hopes Everything Is Illuminated will inspire connection between the audience and their own personal history, as well as with the experiences of those around them in realization of the grander tapestry of human history across the world — much in the way that Jonathan discovers his own history, one that is intertwined with the histories of Alex, a man from the other side of the world, and his grandfather, a man from a different time. Ensemble Theatre Company presents Everything Is Illuminated April 11-28 at the New Vic. Call (805) 965-5400 or see ensembletheatre.com. CORRECTION: This story was amended on April 16 to clarify that Adrian Sparks plays the tour guide Alex’s grandfather, not Jonathan’s.